Senior shortstop Jake Frey broke a 3-all tie with a clutch two-out, two-run double in the sixth inning of their 5-3 victory over Boiling Springs. Junior outfielder Scott Witter drove in a pair of runs during a 3-for-4 afternoon Monday at Boiling Springs. 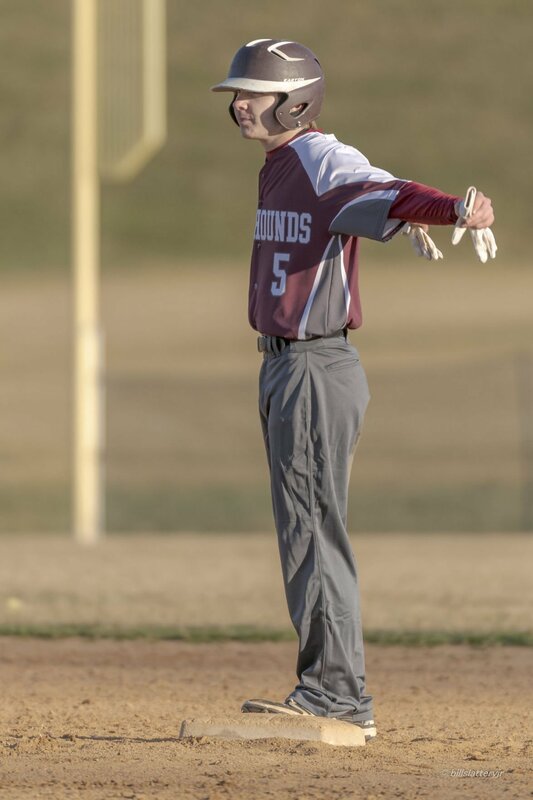 The Greyhounds showed their resilience once again on Monday, using a 2-run double off the bat of senior Jake Frey in the top of the sixth inning to win a tight, back-and-forth contest over the Boiling Springs Bubblers on the road, 5-3. The Bubblers (1-1) maintained a 3-2 edge on the Greyhounds (2-2) into the fifth, having leapfrogged past the Greyhounds with a two-run rally in the bottom of the third. Back-to-back Boiling Spring errors put runners on first and third with less than two outs in the top half of the frame, but Bubbler starter Charlie White fanned the Ship cleanup hitter Nic Weltz for a big second out. The Greyhounds would now need a two-out hit to get the runner home from third – or so they thought. Instead, the visitors took advantage of good speed on the basepaths. Scott Witter took off from first in an attempt to swipe second base, but as soon as catcher Zach VonStein released the throw, the runner on third broke for home. Max Kalb slid home just ahead of VonStein's tag to complete the impromptu steal of home, tying the score at 3-3. Ship starter Luke Davis worked his way out of trouble in the home half, stranding a Boiling Springs runner at third to send the game into the sixth still tied at 3-apiece. The Hounds continued to plug away, getting a sharp lead off single from Christian Melendez and a bloop hit off the bat of Chandler Durf to put a pair of runners on with one out. White, a left-hander, retired the next batter looking, leaving the job up to Frey with two outs. Melendez and Durf advanced 90-feet following a wild pitch, giving the Ship leadoff hitter the opportunity to drive in two with a base hit. Frey sat back and drove the very next pitch over the head of the Boiling Springs centerfielder for a big 2-out, 2-run double to give the Greyhounds a 5-3 lead. The Greyhounds, who have had trouble with their bullpen early on this season, turned to ace Ethan Stouffer to replace Davis when they went back out onto the field in the bottom of the sixth. Stouffer nailed down the victory with a pair of scoreless frames. He also got some tremendous help from his defense, with right fielder Levi Yeager selling out for a tremendous diving catch of a low line drive for the initial out in the sixth. The Greyhounds opened the scoring in top of the first on an RBI single from Witter. VonStein doubled and scored on a error in the home half to tie it. Witter singled to drive in another run in his next at bat to regain the lead, but the the Bubblers took advantage of extra outs provided by the Ship defense to take a 3-2 advantage in the bottom of the third. The Greyhounds out-hit the opposition 9-to-6 Monday. Witter (3-for-4, 2 RBI), Frey (2-for-4, 2 RBI, 1 R) and Melendez (2-for-4, 1 R) had big days at the plate. VonStein (2-for-4, 1 R) and Kaiden Brenneman (2-for-3, 1 RBI) led the way for Boiling Springs. Davis (5 IP, 3 R, 4 K) picked up the win on the mound. The junior right-hander has has played a big role in both of Shippensburg's wins, showing the team that he can be counted on to get big outs. White (5 IP, 3 R, 10 K) was saddled with the loss. The Greyhounds continue their current road stretch when they travel to Middletown Friday for a 4:15 p.m. first pitch.